humanities last stand: Wouldn't You Prefer a Nice Game of Chess? 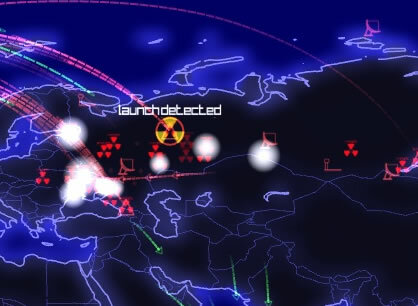 Finally 20 years after Matthew Broderick played Wargames with the US and USSR there is a game that gives you the chance to wage Global Thermonuclear War! 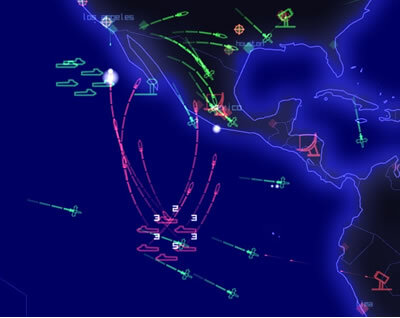 Defcon was released a few months ago and offers up to 6 players (either online or on a home network) the chance to wage war against each other using nukes. The winner is determined in good old fashioned cold war stylee... the winner is the player still alive at the end! "Wouldn't you prefer a nice game of chess?" 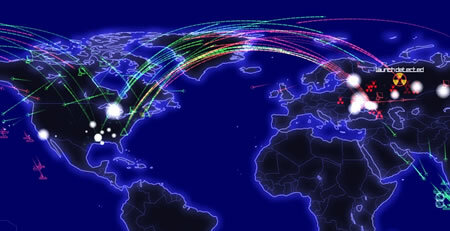 The Soviet Union will rise again! You can even sneak subs right up to the coast and launch a devastating nuclear arsenal. It's a very simplistic game and you can download a fully playable demo from the website (you are limited to a maximum of 2 players in the demo). In brief, it rocks!